Analog Man carries the Foxrox Octron-2. Definitely one of those effects that will get everyone's attention at any gig. Seperate switch for each of the three octaves. Great tracking and very versatile too. 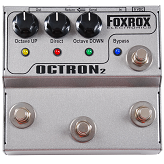 Octron2 is the limited-production version of the Foxrox Octron pedal. Since it's debut in April of 2005, the original Octron pedal has been hailed as a super-organic sounding, high quality analog Octave pedal. It's the only current-production boutique Octave pedal to offer both one octave Up and one octave Down. In May of 2005 Frank Marino (Mahogany Rush) became one of the first Octron users, and he offered some great feedback on what he'd love to see in an Octave pedal. Dave Fox took his suggestions and used them to make improvements in the original Octron, along with the suggestions of others and came up with something cool, new and unique - Octron 2. What makes Octron2 different from the original Octron? - Individual foot switch to activate each of the three signals, Octave Up, Direct, and Octave Down. - Master true-bypass foot switch w/LED mounted on upper level. - Effects loop located after the effect, but before the foot switch. How do you use Octron2? There are a couple of different ways to use Octron2. - While bypassed, choose the mix you want. You can activate any combination of the three signals (Oct Up, Direct, Oct Down). When it's time for your solo, hit the bypass switch and you get the mix you wanted. Make sure you have at least one of the signals activated when you take the unit out of Bypass.. if you don't, the unit will mute and you'll be left with no signal! - Activate the unit via the Bypass switch, and select only the Direct signal and leave it on. This will give you a clean, buffered signal with some available boost. When you want to add Octave Up, Down or both, just step on their associated switches. - Use Octron2 as a Loop Switcher (see specs). I've been searching for my perfect octave for a while. To name a few - Boss OC-2 and 3, EBS Octabass, MXR's newest M288 deluxe, Aguilar Octamizer and EHX's POG... The all had their similarities and stregnths / weaknesses - but none inspired me... The Pog stayed the longest with the digital tracking - but I really disliked the tone and hiss.